Now we come to the penultimate film of Marvel's Phase One. This film, is not perfect, but it has a charm to it. The scrawny Steve Rogers is trying to join the war effort, going to recruitment centers all over the greater New York/Newark area —and is rejected by every single one of them. He is small, about 5 feet, has asthma, and an slew of health problems. He also gets into fights with bullies, never backing down but only failing to get the snot beat out of him because of the intervention of his best friend, Bucky. Eventually, at the Stark Expo, put on by Stark’s father, Bucky picks up Clara Oswald (Really!) and Steve tries to enlist again, but is found out by Abraham Erskine, who somehow figures out about his failed enlistments at other recruitment centers —and promptly enlists him in a top secret government program and thus he is shipped off to an Army boot camp under the purview of Colonel Chester Philips (Tommy Lee Jones), who heads the program, and the beautiful stiff-upper-lip British Army attaché, Peggy Carter (Hayley Atwell). Soon, at the insistence of Erskine, he is picked for the program and taken to a secret lab in Brooklyn where he is given a super-soldier serum and, after taking on a HYDRA saboteur, becomes Captain America —for War Bonds shows. And is stuck there until he goes on a mission, without higher approval, with Howard Stark and Peggy Carter and single-handedly rescues a group of POWs who become the Howling Commandoes. This movie is just charming. No matter what its flaws every time I finish it I just get a smile on my face, despite the sadder-than-usual ending. This movie should be utterly bland and yet, it is quite fun. For one thing, all of the characters feel like a stock character from a 1940s war movie. Steve Rogers is the all-American boy, Peggy Carter is your stiff-upper-lip British officer crossed with 1940s tough gal, and Chester Phillips is your gruff, old American soldier. The same goes for the rest of the Howling Commandoes. Even the villains act like the cheesy villains from a 1940s movie serial or pulp magazine. Now, this could easily go wrong and result in giving us the cheesiest, blandest, annoying set of characters but it doesn’t. Perhaps because they are so familiar we feel like we know them the moment we see them. This makes the characters, especially the Howling Commandoes, seem incredibly fleshed out. Even though they have only a handful of lines each and probably can’t remember their names without consulting a wiki. Their mannerisms, clothing, and overall demeanor tells us everything we need to know about each of them. The cinematography, too, adds to the 1940s feel. The scenes depicting Steve Rogers are full of Norman Rockwell-esque colors and lighting. Like all Marvel movies, this one is a live-action Saturday Morning Cartoon, and it delivers the goods in that department. But there is one area in which this movie is a tad unique, and that is in the two leads, Steve and Peggy. Throughout the movie, as far as romantic leads go, they are ok. As a couple they are far more interesting than Thor and Jane but not as fun as Tony and Pepper. But the end of the movie does something that takes them probably the most interesting couple in the Marvel movie universe. Now, here I’m going to put a SPOILER warning so if you have not seen this movie or Avengers, Captain America: Winter Soldier, Avengers 2, or Ant-Man then read no further! If you’ve seen the movie, or, heck, the ones I just listed, then you might know how it ends. Steve gets stuck in the ice and Peggy grows old without him. In my opinion, it is after their separation that they became really fascinating. For both of them the other represents the one chance they had for something resembling a normal life, and without each other Two people who were meant to be but never can be. That added a dynamic to them that was unique to them and unlike any of the other Marvel movie couples. At least for now. So, in the end, a fun, enjoyable movie. Nice review, Kit. I'm not sure I have anything to add. They didn't KNOW about DNA in 1944! And anachronism after anachronism after... I mean, if you're catering to retro and nostalgia, DON'T DO THAT to an informed audience! Hire a historian--we're a desperate, snarling lot, but not all of us (the unemployed ones, mostly!) hate the United States! WE WILL HELP YOU MAKE IT GOOD! I just kept... Attitudes about women, weapons of the wrong sort at the wrong time, modern slang... I know it's tough. But if you put gravel in the rice pudding it's going to be HARD TO ENJOY IT! The good part is that I quite liked 'Winter Soldier.' But... IT COULD HAVE BEEN SO GREAT! If one is going to a Marvel Film for historical accuracy, or even expects it...I just don't know where to start with that. It's fun. That's all it was meant to be, if that isn't your cup of tea, then that's cool move on. As a retired Soldier I can't tell you how difficult it is to watch some movies, especially some that are set in the period in which I served. They are not documentaries however, and I swallow hard and sometimes I am able to enjoy it in spite of the fact that I spot the errors constantly. I am afraid it's a burden we all must share. I thought it was impressive how the special effects were able to shrink Chris Evans down to the size of a scrawny person. Sometimes digital effects end up creating an "uncanny valley" when they do that (Tron: Legacy did that for me at times), but I thought they were great here. Bob, Outlaw, the reason for apparent anachronisms is hand-wavey super-secret military science. Also, the MCU is a hand-wavey alternate universe with a highly similar but different timeline than our own. Yeah, I know it's unsatisfying, but I guarantee, that's the answer you'd get from anyone directly involved. Think of it as low-resolution/low-fidelity history. As in all things, you can hide a lot of sins in the noise. Kit, the treatment of the Howling Commandos is an excellent example of how to use archetypes correctly. Sure, they're stock characters, but they've got enough diversity among them and enough flesh on top of them to sell the idea that they're not stock. War films and heist films tend to lean heaviest on that technique--filling the cast roster with stock to circumvent character development--to varying degrees of success. 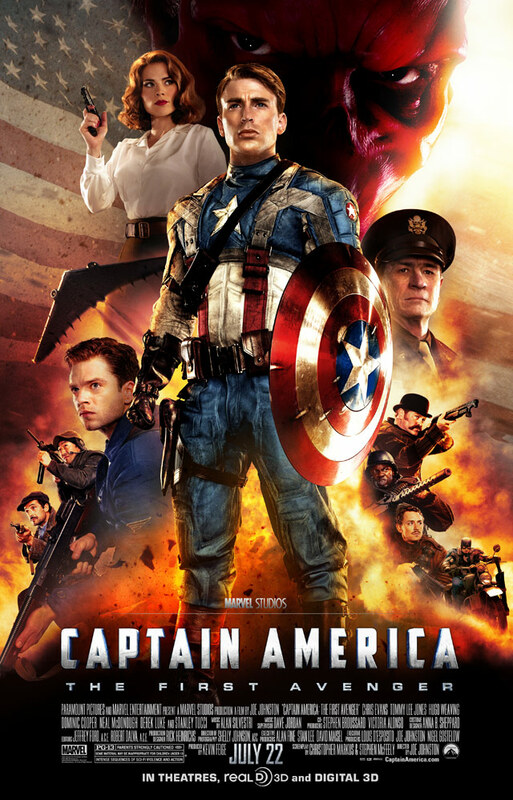 I think following that formula is what gives Captain America its charm and nostalgic feel. Not to be a stick in the mud, but DNA was discovered in 1869 so it was known to exist and known to transmit traits by 1944. If that irritates some people, I wonder how they feel about adamantium or vibranium. I agree with Kit's review. It is a fun, entertaining movie, I like the term charming, but it isn't a great movie. It's a fun movie, but I'm not really excited by comic book movies anymore... they tend to blend together after a while. I absolutely love the "Star-Spangled Man" number and all the WW2 period details. And as a graphic designer, I have to call attention to the end credits with the animated propaganda posters. Kit, I watched The Gathering Storm on Amazon Prime last week. Good movie, only wish it were longer! "as a graphic designer, I have to call attention to the end credits with the animated propaganda posters." "I watched The Gathering Storm on Amazon Prime last week. Good movie, only wish it were longer!" That is a weakness for Gathering Storm. I kind of found myself wanting to spend some more time with Churchill in that movie. "the treatment of the Howling Commandos is an excellent example of how to use archetypes correctly. Sure, they're stock characters, but they've got enough diversity among them and enough flesh on top of them to sell the idea that they're not stock." Agreed. You don't need to give them, or have the movie go into, in-depth back-stories because you know the characters on-site and can fill in the details in your head. "I thought it was impressive how the special effects were able to shrink Chris Evans down to the size of a scrawny person. Sometimes digital effects end up creating an "uncanny valley" when they do that (Tron: Legacy did that for me at times), but I thought they were great here." I agree, the only part that stuck out was his voice sounded a tad too deep at times but for the most part it worked like a charm. Roger Ebert was apparently genuinely confused as to how they pulled that special effect off. I'm gonna side w/ Tyranmax on this one: "the MCU is a hand-wavey alternate universe with a highly similar but different timeline than our own." In Captain America you have Howard Stark developing a prototype (still not fully operational) flying car and in the show Agent Carter Stark has a device that causes an entire factory to implode and vanish. Stupid oversight by the writer but, eh, not a biggie considering all the other egregious assaults on physics, history, and logic that occur in the MCU series. Kit, isn't that device developed from the Pym Particle, which ties into Ant-Man? Sums up the movie in a nutshell. RGallegos, I think that sums the sense of this film up very well.